If you’re having friends over for a few drinks this weekend or looking for a wee snack to serve while watching the game, you can’t go wrong with these haggis nachos. They take only 10 minutes to prepare and will move almost as swiftly from the plate. Enjoy! 1. Heat some Macsween Haggis in the microwave per the packet instructions. 2. Empty the large bag of tortilla chips onto a large plate. 3. Dollop generous spoonfuls of guacamole and salsa over the chips and add a few jalapeño peppers if desired. 4. Once the haggis is piping hot, dot spoonfuls onto the top of the nachos, adding a few spoonfuls of sour cream and roughly chopped coriander to finish. 1. Top with cheese and fresh chillies and eat immediately (with beer). Why not try some more haggis recipes from Jo Macsween’s The Haggis Bible available here. 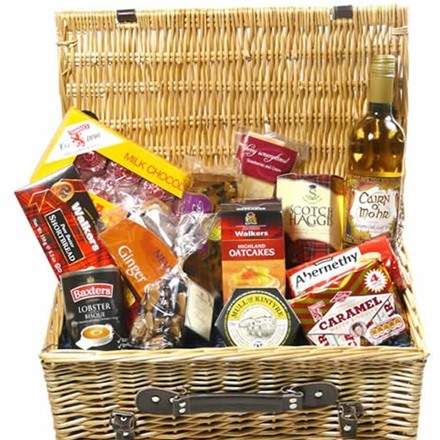 And don’t forget we also sell Taste of Scotland gift hampers too.